The existence of Doomtrooper was news to me until today. This collectable card game was one of many to appear in the 90s following the success of Magic: The Gathering. It lasted longer than most with a variety of expansions and translations, but ultimately faded into relative obscurity. Have a look at all the best PC card games. I say ‘relative’ because a digital revival of the game hit Kickstarter earlier in the week and met its funding goal in just a few days proving that yes, other people remember Doomtrooper far better than I do. The developers at Secret Cow Level already have an alpha currently in testing, and beta is set to follow early next year, which will certainly be helped by these crowdfunding results. The team includes Justin Reynard, veteran of Fallout: New Vega, Dungeon Siege III, and Alpha Protocol, and Bryan Winter, original designer of the CCG. The basics are in place, and the Kickstarter is there to fund costs for implementing the remaining cards and improving the graphics engine. 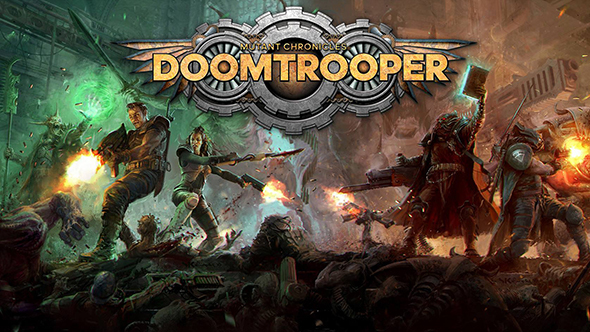 Oddly enough, this isn’t the first Doomtrooper videogame. Doom Troopers released for the Super NES and Genesis way back in 1995, but you’ll be forgiven for not remembering that one. Sadly, it’s not the classic you might see on Mini SNES. It’s a good day if you’re a fan of both video and tabletop games, with Resident Evil 2 having just smashed a Kickstarter to move in the opposite direction.